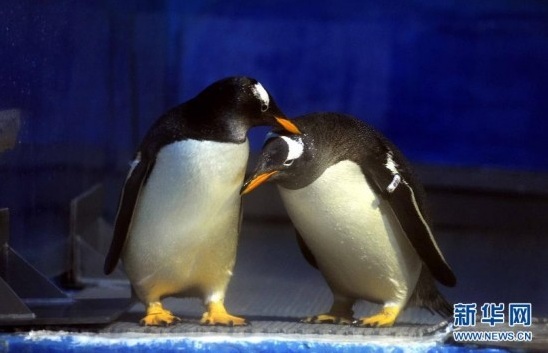 Gay penguins can be found in several zoos around the world, but one gay penguin couple at the Harbin Polarland Zoo in northeastern China, who repeatedly tried to steal the eggs from a heterosexual penguin couple, was recently given a chance to adopt. Male and female penguins assume parental roles during their mating season, preparing nests for the newborn and taking turns incubating the egg until it is laid. When male penguins have male partners rather than females, they will still perform the nesting rituals and, if there is no egg, their parenting instincts are so strong that they will try to steal eggs from other penguins. 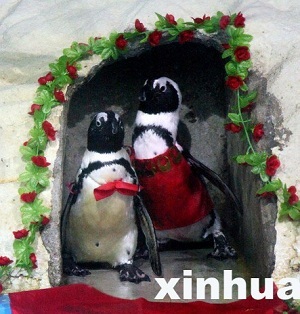 Gay penguins in China's Wuhan Zoo in wedding ceremony: image via shanghaiist.com Though zookeepers at the Harbin Zoo separated the male penguin pair, '0310' and '067,' for a few months, trying to 'straighten them out' by keeping them with female penguins during the mating season, the experiment failed, as it usually does with gay penguins, and 0310 actually became very sick during the period. Much to their relief, I'm sure, 0310 and 067 were reunited. 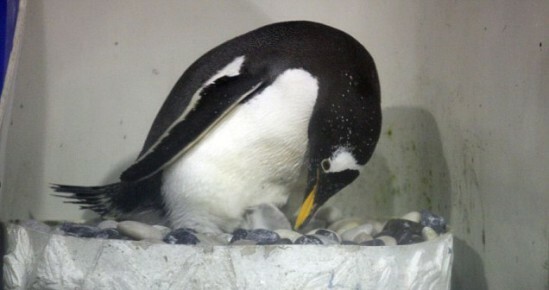 As is instinctive to them, the pair began collecting material for nests and then searched for and attempted to steal the eggs of other penguins, cleverly swapping them for stones! The gay couple must have made real pests out of themselves because zookeepers finally let them adopt their own penguin egg, one of a set of twins born to a heterosexual penguin couple. Now both twins have hatched and its up to 0310 and 067 to feed theirs and be kind and loving parents.